Click on a chess piece under "Lessons". Scroll down to "Basics: How the pieces move" and click on a piece. To watch pieces move, click on the forward arrow under the chess board. Note: To find out more about board codes, see page 9 of your book. Click on a link in the playlist. 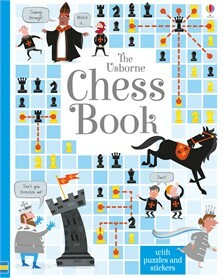 Click on the topics in the menu on the left for guides to the chess pieces, moves and check, checkmate and stalemate. Make the next move as White. To watch the solution, click "Answer", then click "Retry" and try to make the correct moves to solve the puzzle. View or print out the puzzles. There are solutions, too, if you get stuck.